We asked dozens of marketers to share the tactics that work for increasing website referral traffic. Here’s what we learned. 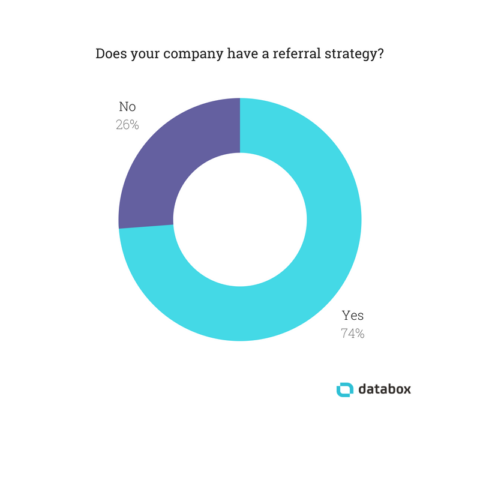 74% of marketers say that their company has a deliberate strategy for increasing referral traffic. When we dug into the quantitative data behind our research, we learned something interesting – while referral traffic does tend to convert at a higher percentage in comparison to other channels (organic, direct, etc. ), it’s not as dramatic a difference as most would think. 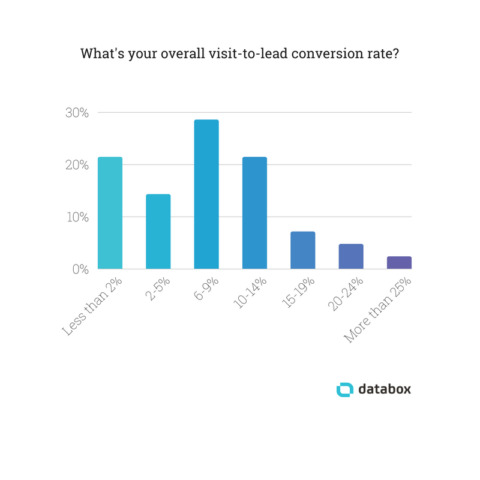 The biggest difference was in the segment reporting a 2-5% visit-to-lead conversion rate. 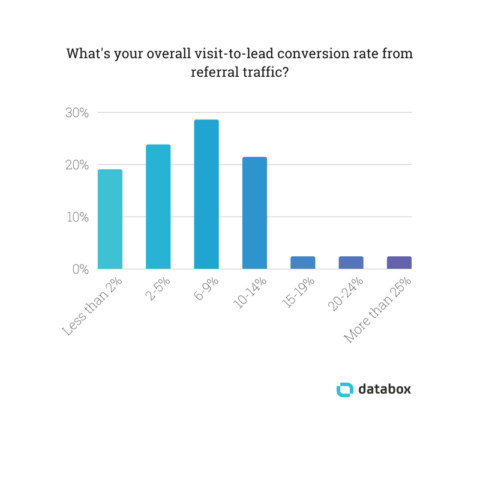 This segment saw 64% growth when comparing referral traffic to overall traffic. However, perspective is everything here – a seemingly small increase, from 2-5%, can yield big returns on overall leads and sales for any business. The more traffic a website is generating, the greater impact that growth is having. Obviously, there’s value in referral as a channel. Not only does it convert better, but it’s a credibility booster, too. Like most effective marketing tactics, referral traffic is driven by merit. Sure, there are companies out there that buy links, but in order to build a sustainable referral strategy, there needs to be a deliberate focus on quality and relationships. We asked dozens of marketers to share what’s worked for them. Here’s what we learned. *Editor’s note: Want to see something really cool? You can visualize your traffic by source, in a variety of visualization types, in just a few minutes. 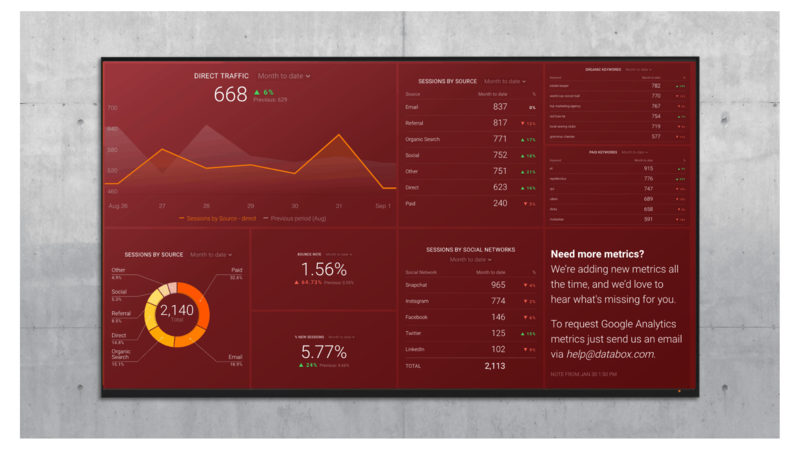 Grab this free Google Analytics template and track all of your essential website KPIs in one place. But don’t start guest posting everywhere you can just yet. It’s a long-term process. But it can work. So how do you actually go about guest posting? How do you make it happen? Find magazines and blogs/websites that cover your subject and are read by your target audience. Give the website a browse to see how you might contribute. Email them and pitch your idea for a guest post or guest article. Follow up until you receive feedback (good or bad). Laura Cabrera from Outcry.io also gave advice on finding places to guest post. “The goal is to have a few sites where you’re a consistent contributor,” she says. Many people focus their efforts on high-authority sites for “link juice,” says Ben Taylor of HomeWorkingClub. But, guest posting can actually get you a solid amount of referral traffic, too. Marketers are also fixated on the A-listers, but Jx Tan, principal consultant at Momentum Digital, says there’s value in lesser-known partners, too. “Leaving thoughtful or insightful comments on industry or influencer blogs is one of the most overlooked referral strategies we’ve come across,” says Colibri Digital Marketing‘s Andrew McLoughlin. “So long as you’ve sufficiently acquainted yourself with the blog you’ll be commenting on, and so long as that blog is under the direct control of its author, your comment can become the first step toward a dialogue, a referral, or a partnership,” adds McLoughlin. McLoughlin points out that writing a comment is much faster than writing a blog post. So you can use this strategy to create more interactions than you would through guest posting or cold emailing. Rick Ramos, CMO of HealthJoy, says that in his experience there are two types of content that are more likely to provide value and get picked up by larger publications: studies/surveys and infographics. “This type of content is very time consuming to create, but the results are amazing. If it’s unique enough and talks to a broad industry, it can be picked up by some pretty large publications,” said Ramos. It’s important to remember that just creating content isn’t enough. You have to promote it too, according to Dario Sipos of DWR. His company uses videos in their content marketing, but they place a strong emphasis on effective promotion to get referral links. To stand out, it’s worth looking into less common types of content. Infographics grab people’s attention, but they’re all over the place now. Kent Lewis, founder of Anvil Media, suggests trying a podcast. “Podcasting offers a unique opportunity to generate inbound links via consistently compelling content,” he says. By combining that with competitive benchmarking, you can put out better content than your competitors. “The best way to increase referral traffic is to actively seek out opportunities to build relationships with website owners in your niche, sponsor events or meaningful causes and put a content marketing plan in place that includes an outreach and amplification strategy,” adds Pagotto. “If you can find an active forum related to your niche and build a presence on there as a valued member, it can become an incredible source of referral traffic,” says Max Robinson, founder of FishTankBank. “Make sure you do some screening; answer questions which have been viewed by a lot of people but not had many answers, this will make sure you don’t get lost in the noise,” adds Pritchard. We also had a very interesting tip on getting referral traffic from forums and Q&A sites from Jim Milan, communications and organic search manager at Auto Accessories Garage. Instead of just engaging on forums, you can also sponsor them. Milan’s company also posts information and ads on some of those forums to drive more traffic. “The traffic from these sites is often highly qualified,” which is a huge bonus. Many marketers mentioned Quora, possibly the most popular Q&A site around. Of course, you’ll need to provide value to readers. “I search for questions that people have asked relating to fashion, music festivals, online gaming, and other topics related to our brands,” says INTO THE AM hiring manager Darren Schreher. If you answer the right questions and point readers to the right pages, you can get very well-qualified leads. “On certain relevant Quora answers that feature AND CO, we have an almost 13% conversion rate,” says Sophie McAulay, growth and content strategist at AND CO.
Like forums, social media can be a great place to address customer pain points. Once you’ve built a connection, you can subtly pitch your product or service. Positive reviews and great testimonials are great for overcoming buyer nervousness about your product or service. But they can also be a source of referral traffic. If you’re not sure where to find these opportunities, Spilker recommends tools like SEMRush and Ahrefs to find links to your competitors’ sites. And Heartland takes advantage of multiple media: written testimonials both with and without images and video testimonials have proven effective. “To increase your referral traffic you must first increase your brand authority,” according to Tim Absalikov, co-founder of Lasting Trend. How do you do that? In addition to guest blogging and building relationships with influencers, Absalikov recommends going offline. Consumers are getting increasingly savvy to marketing tactics. But other marketers can content creators are especially so. You’ll need to provide value that they can pass along to their readers if you want referral traffic. It may be through offering great content they can share with their readers. Or exclusive products to interview. It might even be, as SIA Enterprises‘ Syed Irfan Ajmal suggests, a product giveaway. By providing that value and creating a real relationship, you’re more likely to generate the links and influence you need to boost your referral traffic. Have you made an effort to increase your referral traffic? Which methods did you try? Which worked best for you? Share your thoughts in the comments below.